Elan Valley - here we see fossilised remains of great submarine landslides called turbidites. We also admire the glaciated scenery and learn the story of the Victorian dams built to provide Birmingham with water. 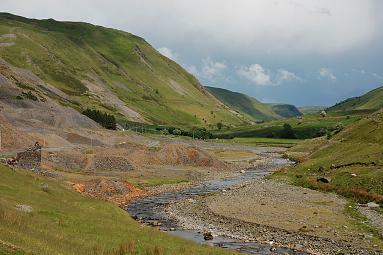 Cwmystwyth - here we visit the remains of Mid Wales' largest former metal mine. In the spoil heaps it is possible to find your own beautiful specimens of galena and chalcopyrite. Devil's Bridge - here we walk down to see breathtaking waterfalls that cut through the Llandovery aged rocks. Llywernog Silver Lead Mine - here we go on an underground tour and learn how hard the life was for these metal miners.